Are tickets still available for James DeGale vs Chris Eubank Jr? Two of Britain’s finest meet in the highly anticipated super middleweight bout on Saturday 23rd February with a lot of pride on the line as well as the IBO championship. James DeGale has billed this as The Retirement Fight alluding to the fact that him or his counterpart Chris Eubank Jr should “knock it on the head” should they lose. In truth, neither fighter is likely to retire after this fight, especially Eubank Jr who is not going to stop any time soon. For DeGale, it is slightly different as he had a very difficult 2017. He went without a win in two gruelling fights - first against Badou Jack in which he drew and then suffered the second loss of his career in another 12 rounder against Caleb Truax, surrendering the IBF belt. Eubank Jr has also had some tough fights and impressive wins but is a lot fresher. After claiming the IBO belt with a TKO over Renold Quinlan, he edged the experienced Arthur Abraham and then came up against the undefeated Avni Yildirim and knocked him out in the third round. 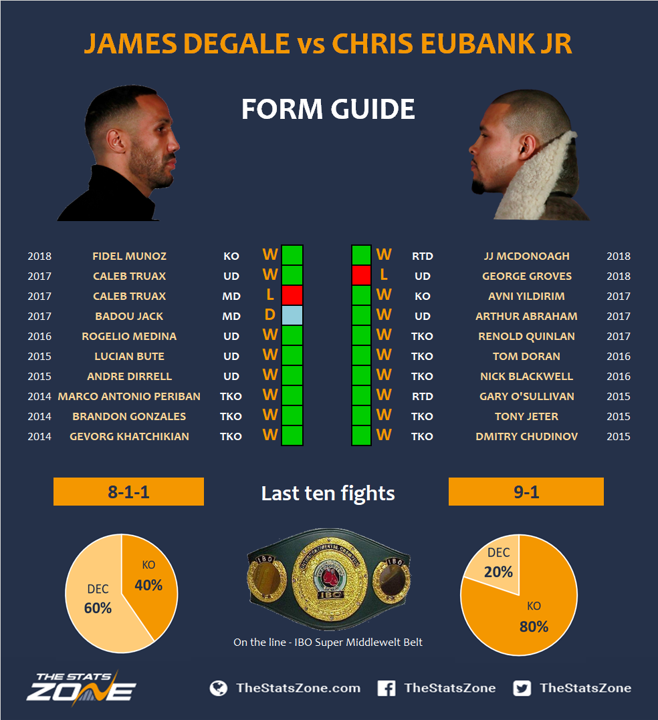 As DeGale is not known for being a power puncher and has only one knockout victory since 2014, you feel he has to be fully recovered from his injuries to hang in there with the younger and fresher Eubank Jr in the latter rounds. 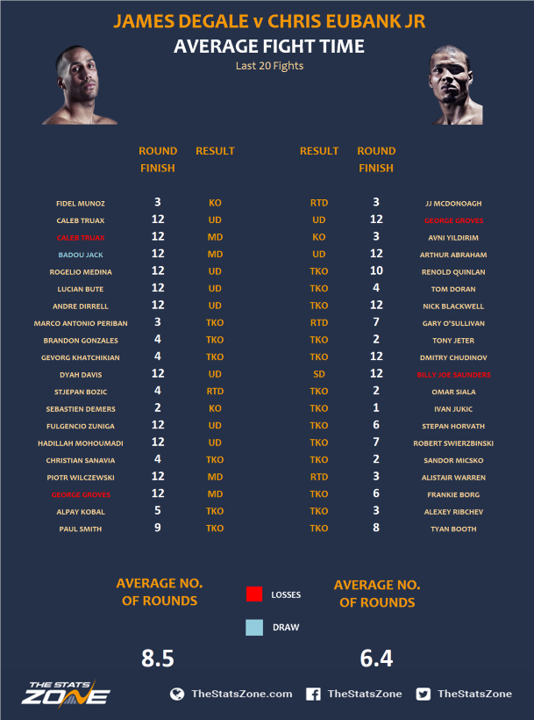 He has only just turned 33 but has a lot of miles on the clock and as you can see by the breakdown of their last 20 fights, DeGale has been involved in more rounds and it is those six 12-round fights in a row against Traux and Jack as well as Rogelio Medina, Lucian Bute and Andre Dirrell that took their toll on his body. 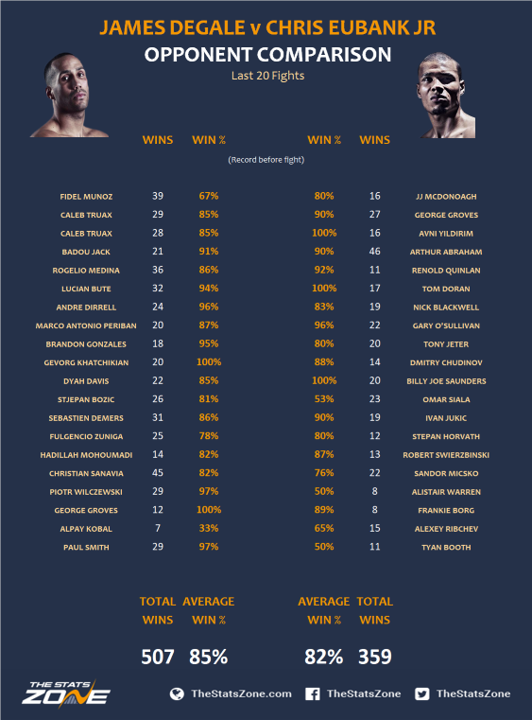 This fight is likely to be very closely fought and decided at the bell. 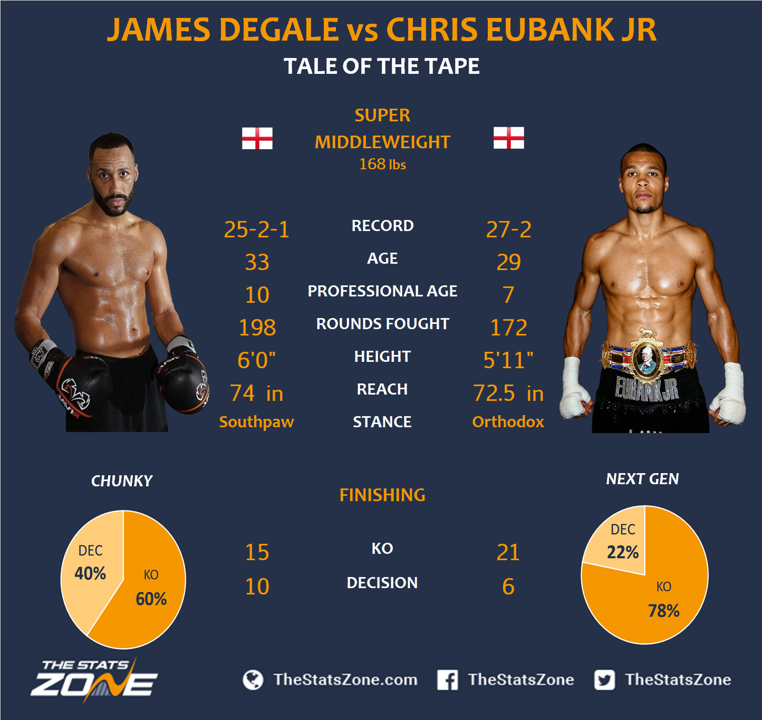 DeGale is better technically and if he is fully-fit he should be able to outpoint his foe but this is probably the best time for Eubank Jr to fight him. 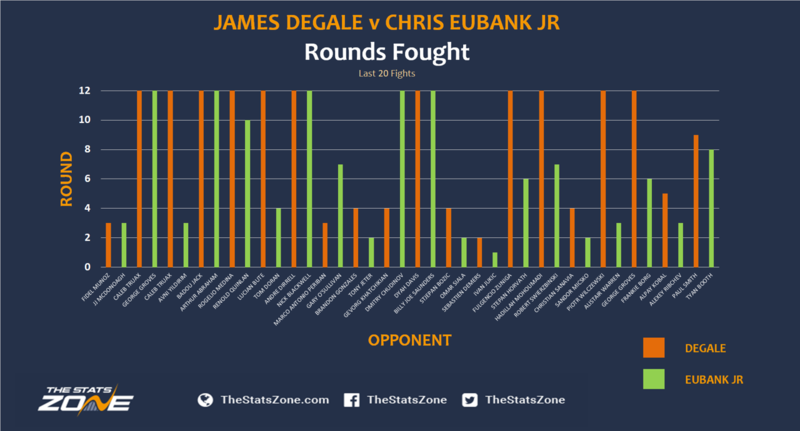 Eubank Jr’s confidence is always high but he will feel DeGale’s performances have declined since his fight with Dirrell and wants to cash in and add the biggest name to his win column. This is a great opportunity for Eubank Jr to finally prove he can beat elite fighters. It will be tight and if the fight is going to be stopped it will be Eubank Jr and probably late on. We don’t know how much ‘Chunky’ has left in him but if he is fully-fit and motivated, he has the class and experience to edge out ‘Next Gen’ in a close decision.